So after I blogged about receiving cabbage in my bi-weekly Boston Organics delivery and asked what to do with it, I had multiple people suggest making corned beef and cabbage since St. Patrick's Day was coming up. 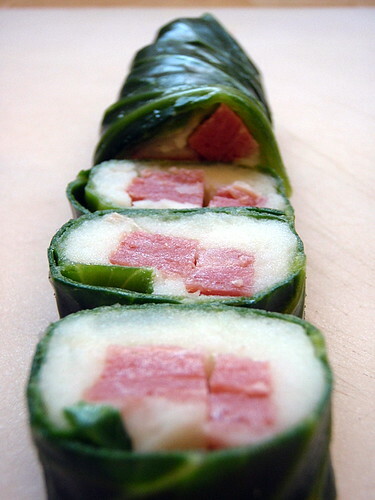 Well, I'm not really into boiled dinners (other than ramen, haha), but I did see this link on The Kitchn for corned beef and cabbage rolls and thought it was a cute idea. The dipping sauce seemed a little difficult to make, however, compared to the ease of making the rolls so skipped that part and decided to add mashed potatoes inside the rolls instead so it would look more like a normal maki roll. Add the cubed potatoes to a large pot and add enough cold water to cover. Bring to a boil and cook for 15-20 minutes, until potatoes are soft when you insert a knife. Drain and transfer to a medium bowl. Add butter and milk and mash until there are no lumps. Salt to taste and set aside to cool. Start boiling a large pot of water. Gently peel off the cabbage leaves, keeping them whole. In two batches, simmer the leaves for 8-10 minutes or until soft. Transfer from the pot to an ice-water bath. Pat the leaves dry and set aside. Slice the corned beef into long strips. Lay out a single cabbage leaf. Spread mashed potatoes over the bottom 2 inches, and place 2-3 strips of corned beef in the middle of the potatoes. Roll the cabbage leaf up tightly. After all the leaves are rolled, cut into bite-sized pieces and serve. I found that the maki was flavorful enough not to need a dipping sauce, but I guess you can use a mustard or honey mustard if you really want. I brought these to a party on Saturday and didn't get to ask anyone what they thought of them, but when I went back at the end of the night, they were all gone except for two pieces, so I assume people liked them. =) Happy St. Patrick's Day everyone! Next up: What to do with leftover corned beef and potatoes: Corned Beef Hash (and Pasties)! So cute. A clever idea you have! Sounds delicious and looks adorable! Your food looks great! I love it. Do you cook all or some of this stuff? I post everything I cook and some other things as well. Those look great! Great idea to put the mashed potato inside the cabbage. I love this, too! Very cleaver! !